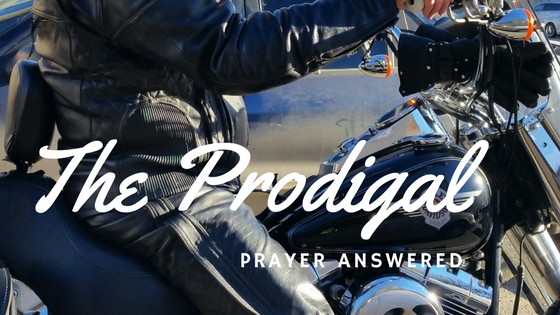 I am writing “The Prodigal” for three reasons. First, to draw attention to the amazing grace of our Heavenly Father. Second, to honor my Christian parents and recognize their investment in my life and their prayers for Pat and I. Thirdly, to encourage parents, grandparents, family and friends to keep on praying for your loved one, no matter how hopeless things may look. I was a normal kid living on a farm with honest and God following parents. Our church was a small Full Gospel work in Radville, Saskatchewan. There was nothing to inspire young people. Two negative things marked the wonderful innocent years growing up on the farm. One was sexual molestation, another was a violation of my sexual innocence by materials that were never in our home. These are not an excuse for my behavior in my early teens but they were an introduction of evil into my mind and heart. I determined to experience the things my parents had warned me about: girls, rock music, alcohol, fighting, driving too fast, dancing and movies. It sounds old fashioned, like the innocent pursuits of a teenager, but I was out of control. I defied my parents and broke all the rules. Outwardly looking like a typical kid growing up in the 60’s, inside I was filled with conflict, self-doubt and fear. I was afraid of God, afraid of being left to perish if the Rapture occurred and ashamed of what I was doing. As the years went by, I failed at school and was soon a high school dropout. I remember being on the verge of a sexual sin with a local girl and suddenly coming under a terrible conviction. We stopped doing what was about to happen and drove to my parents farm. They led the young woman to Christ. However, I could not surrender. So a wild, out of control season took a dark turn into a drunken fog. After drinking all day in Westby, Montana I wrecked my car and ended up in jail in Weyburn. I was so toxic on alcohol the police took me from the cell to the hospital. My parents came in the wee hours of the morning to get me. Mother told me years later that she asked me that night why I was running away from God. My reply was, “If I stop running I will have to be a preacher.” I do not remember! The assistant manager at Northgate Mall Safeway, where I worked, was a godly Christian man who attended Hillsdale Alliance. God showed him I was from a Christian background. He would plead with me to give my life to Christ. I just couldn’t! Years later while attending Bible School in Eston, I connected with Bob Kinnie my boss at the Safeway. He wept with sheer joy when he heard what God had done. He told me he prayed for me all the time. About 1967-68 I was engaged to Pat, my one and only wife. However, I drank so much everything about me was crumbling. A girl from the past came along as a distraction. In a foolish state I walked away from everything: Pat, job, and car. I hitchhiked to Calgary to “find myself“. The prodigal didn’t find anything but a drug and alcohol mess. I hitchhiked back to Regina for Pat. She was heartbroken and angry at my behavior. She had gone to live with her grandparents in Hazenmore to find her balance. I arrived looking like the lost soul I was. She slowly let me back into her life. While walking around Hazenmore we found a closed Anglican church. The door was unlocked so we went in. Walking up to the pulpit, I stood there gazing down at a large dusty Bible. Feeling a sudden homesick melancholy, I went and sat in a pew and quietly wept. Pat came and sat down, asking what was wrong. God was tugging at my heart. The prodigal pushed it away! Shortly after, Pat and I “ran away together” beginning a new life in Calgary. There we lived in a common law relationship. All the while, my parents prayed and prayed. From time to time they would send books, Bibles or encouragement to go to a church. But we pursued a life of drinking, partying and drugs. Pat and I were married back in Regina at a United Church. I remember my parents trying hard to smile at the wedding but all the while being haunted by our dangerous lifestyle. In 1972, Pat and I were home for Christmas on our farm near Radville . We had drugs with us, using them all the time, even while flying on the plane. Mom told me later, she felt a real “darkness” around us. Early in 1973 a number of events and experiences shattered my prodigal world. We had put some money together with others to send someone to Beruit to buy hashish, a strong drug you smoke. The person was arrested and put in prison in Lebanon. Our marriage began to fracture with all the drugs and the parties. I was working as an assistant manager in Loblaws. Unknown to me, I was on probation. The leadership knew I was stoned everyday at work. We began to hang out with a motorcycle gang called the Grim Reapers. Things reached a climax with Pat back in Regina, both to escape the stress between us and to visit her folks. I partied all night with the Grim Reapers arriving back in our apartment in the early hours of morning. I was high on “speed”. Everything in my mind and body was racing. The prodigal felt invincible! Suddenly sober, scared and desperate, in anguish I said “God, please help me”. A deep peace came over me. Even though you never sleep on speed, I went into our kitchen, laid down on our bed and fell sound asleep. A motorcycle was in our bedroom. Don’t ask! When I woke, there was that homesick melancholy. That evening, Sunday, Pat flew home from Regina. My sad demeanor, which I couldn’t understand, was misconstrued by Pat. She thought I had met another woman. For about two weeks without drugs, drinking, or listening to Rock n Roll, I just sat quietly. A series of events began to happen! Out of the blue, a heroin addict (who claimed to be an atheist) dropped some Hal Lindsey books off. After two weeks, I came home from work for supper with Pat. I told her I knew what I had to do. She expected me to leave her. Instead, I got down on my knees giving my life to Christ. She did the same days later. The rest is history! God has blessed our lives from March of 1973 until this very day. Keep praying! Don’t give up! The prodigals will come home! Pastor Dave Wicks not only became a pastor but is now a pastor of many pastors as the Regional Director of ACOP South Saskatchewan Region. Through his gentle, quiet, joyful nature and steadfastness, He is an inspiration to many people across denominational and generational lines. Though I have know Pastor Dave and his beautiful wife Pat for only a short time, I come away from every meeting motivated by the great love and grace that lavishly flows from their lives. They are champions in the faith!